Most VPN services try to reel you in with overblown superlatives like “fastest in the world!” and “The most secure ever!” If you dig into claims like that, they usually turn out to be either stretched truths or outright falsehoods — especially since every other VPN is making the same claim. After a while, the entire VPN industry seems to blend together into one amorphous blob. That’s why Ivacy VPN has a different philosophy. Instead of throwing out spurious claims, they set their sights on a far simpler — but more honest and difficult — goal: 100% value. They’re a customer-focused company, which means that every time they make a design decision with their product, the ultimate goal isn’t some internal benchmark or technological feat. It’s your satisfaction. Customer-focused businesses are increasingly rare in the age of digital marketing, where everyone’s chasing numbers instead of human beings, and Ivacy’s approach feels pretty refreshing. It’s nice to be put first every once in a while, and actually feel like a person, when you’re dealing with a digital company. Right now this ultra-flexible Ivacy Subscription is offering a special deal for Java Code Geeks readers. Get a one, three, or six month subscription for just $1 per month. Plus you’ll receive a free bonus subscription to Sticky Password Premium to manage and protect your passwords. And if you’re concerned about Ivacy slowing down your internet speed, rest assured it won’t. Ivacy won the Fastest VPN award at the BestVPN.com awards held in Vegas, and they’ve consistently occupied the top spot on various publication’s “Fastest VPN” lists for years. 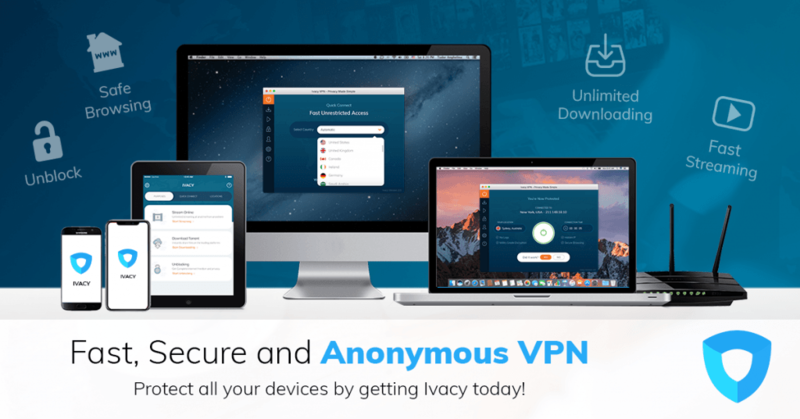 Ivacy VPN is dedicated to giving you the best VPN you can possibly hope for while traveling. Nobody likes waking up after a long flight, schlepping to your hotel, and opening up your laptop only to discover that the show you’ve been binging is region-blocked. Unfortunately, it’s one of the main side effects of traveling, and there’s nothing you can do about it… right? Wrong. One of Ivacy’s main priorities is making sure that their service is beneficial to travelers, which is exactly why they have over a thousand servers, in more than a hundred locations, so they can offer incredibly fast downloading, streaming, and website access no matter where you are. Plus, Ivacy works with a browser extension, making its use quick, easy and intuitive. Ivacy was designed with an intentional focus on secure downloading. Most of us know the feeling of suddenly realizing our computer has been infected with malware, and the helplessness that results. A ton of users told Ivacy about their concerns regarding malware and viruses, and they listened. That’s why Ivacy has a toggleable “Secure Download” feature that can be flipped on with a single click. It utilizes P2P optimized servers for steel-reinforced-concrete security (metaphorically speaking), all without compromising download speed. Seventy percent of all internet users go out of their way to stream their favorite content, but Ivacy knows that they often can’t access the shows they need because of their location on the globe or other petty inconveniences. That’s why Ivacy made sure their VPN allows users to access whatever they want by enabling restricted content like Netflix US, BBC iPlayer, Hulu, ABC, and more. There are 80+ channels available directly from the Ivacy app, which even has an easy-to-use and effective browser extension for maximum efficiency. If you’re a heavy-streamer, you’re not going to find a VPN more customized to your specific needs than this one. With hacking, spying, and high-profile political controversies, there’s a lot of justified concern over the security, privacy, and freedom of the modern internet. People don’t know if they’re being tracked, or if they are, how the data about their internet surfing might be used. That’s why Ivacy made it a priority for their VPN to allow downloading, streaming, and full access to websites blocked in the country of the user. They do this with over a thousand servers, in over a hundred locations, around the world, and by including an Ivacy browser extension that makes employing their VPN as simple and intuitive as possible. With hacking, spying, and high-profile political controversies, there’s a lot of justified concern over the security, privacy, and freedom of the modern internet. People don’t know if they’re being tracked, or if they are, how the data about their internet surfing might be used, so there’s a lot of concern about digital footprints and unencrypted web usage. That’s why Ivacy made sure its users can surf the web with complete security by building their service on top of military-grade encryptions of up to 256-bit, and guaranteeing that a user will remain anonymous and never reveal their identity by accident (if you do it intentionally, well, there’s nothing we can do to help you). Don’t forget Ivacy one, three, and six month plans are currently on offer for just $1 per month, plus you’ll get a free subscription to Sticky Password Premium. Don’t miss out on this special offer. Buy it here.